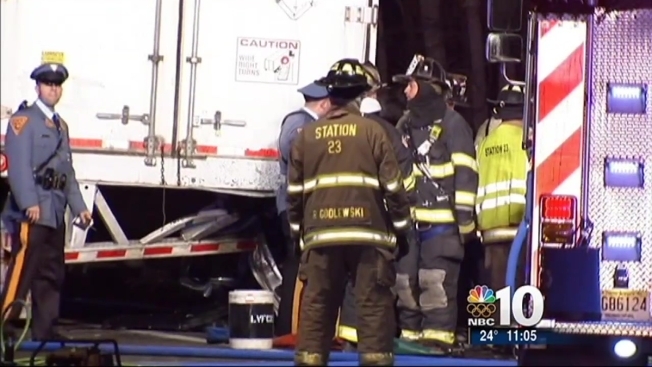 Two young women and a young man died after their car became lodged under a parked tractor-trailer. And, New Jersey State Police say the teenage driver of the out-of-control Volkswagen GTS tried to flee the scene despite suffering injuries himself. Luis Delcid-Cardona, 19, is charged with DWI. The crash happened on I-95 southbound near mile-marker 8.8 in Lawrence Township, N.J. -- that's just past the interchange for I-295 northbound -- after 1 a.m. Thursday. Two young woman were unrestrained in the back seat. Investigators say Nicole Rodrogues, 20 of from Yardville, N.J. was partially ejected from the car and Samantha Belliveau, 18, of Hamilton, N.J. was thrown from the car. The teen police say is responsible for the accident on I-95 that killed three will face charges. The women were best friends, according to those who knew them. Both died at the scene. "Everyone knows them," said a friend. "It's sad." The front seat passenger Jonathan Rivas, 19, of Princeton was buckled in at the time of the crash, but died Thursday afternoon at Capital Health-Trenton, according to police. According to police, Delcid-Cardona of Hamilton was behind the wheel and driving in the center lane when he suddenly lost control, spun out, hopped over the curb that separated the roadway from the Route 1 ramp and smashed into the back end of the parked truck. After the wreck, police say Delcid-Cardona tried to get away but he was arrested a short time later on suspicion of driving while intoxicated. It took crews hours to get the Volkswagen removed from under the truck. The car was so badly damaged that it was difficult to tell what type of car it is. The teenage driving in a wreck that left two women dead and a man badly hurt faces DWI charges. Police continued to investigate through the morning blocking the merge ramp for about five hours. It wasn't clear if speed, possible icy conditions or other factors played a role in the wreck. Thursday night, Belliveau's manager at the Texas Roadhouse where she worked as a waitress closed her station and set up a small memorial. "She came into work and she lit up the place," said restaurant owner Norman Patten. "People loved working with her." Police expect the Mercer County Prosecutor's Office to file more charges against the Delcid-Cardona. He is under guard at the hospital. His bail is set at $1 million.